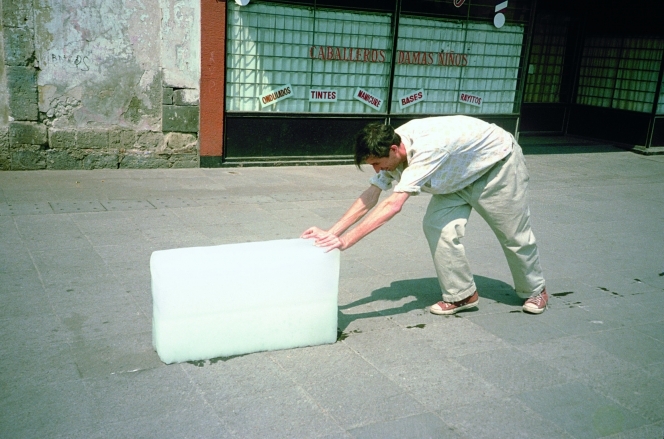 Alÿs enacted Paradox of Praxis 1 (Sometimes Making Something Leads to Nothing) in 1997 in Mexico City. The film depicts a simple and seemingly pointless endeavour - a large block of ice being pushed through the city streets for 9 hours until it melts away to nothing. The theme of transformation, poetic by definition but also a little subversive, is central to Alÿs work. There is a balance between absence and presence… between the idea and the object… between what isn’t there as well as what is; the space between things in which transformation occurs. All his actions are made as a response to a context and a moment, therefore he never re-enacts them elsewhere.